The news is crawling with virtual reality (VR) as writers try to nail the big story that no one else saw coming. When Facebook bought Oculus Rift for $2billion the world stopped treating VR like the new kid at school and before we knew it a space-race launched in which every venture capitalist is out to win. Apple want to make its augmented reality platform the largest in the world, Snapchat won’t stop pushing the boundaries of puppy-ears and let’s not forget how Pokémon took over the world. But what if they got it all wrong? Kendra Horsburgh is a leading artistic director and choreographer that is using VR for everything VR isn’t expected to be. There isn’t a tech firm driving her to fuel the VR-revolution or even a VC trying to win a golden ticket. But they should be. This is an opportunity not to be missed. Without the need to shoehorn VR into everything she does, Kendra created NOX: EVIDENCE OF ABSENCE, an immersive performance that could only work if there were a way to defy gravity, space and time. So whilst all the tech giants are telling us how incredible VR is using performance, Kendra is showing us an incredible dance theatre performance using VR. The experience isn’t about the headset. It’s about total immersion into a live dance experience. NOX asks a question inspired by Robert A. Johnson’s theory in Owning Your Own Shadow. What would you see if your shadow became another conscious being that is everything that you’re not? As the performance begins you are guided into a space where you put on your headset and the VR kicks in. Ten people at a time are choreographed through the narrative of a girl who meets ten fleeting shadows that all interact with you. If you’re not familiar with Kendra’s work, watch The Aviary and it will all become clear. In NOX, her eleven dancers expose you to smells and gusts of wind as you’re guided around the stage from one chapter to the next until; finally, it comes to a finale like the Sixth Sense did. And you never forget that. Kendra developed the concept, vision and choreography. With Maskomi, Mutiny Media and independent arts producer, Rajpal Pardesi, Kendra designed everything around the performance using off-the-shelf hardware. Mixing VR 360 video with a live camera feed enabled them to have virtual characters interact with the live dancers. Where it gets even smarter, is that they coupled VR streaming with a surround-sound system, created by sound artist, Filipe Gomes, placing the sound around the room so that your spatial awareness flows seamlessly. A phone hack allowed them to synchronise the headsets for ten participants to experience the same thing at the same time, triggered by the sound. They then gave the participants Subpac’s, turtle-shells that contain sub-woofers so that they can feel their way around the room. The participant finds himself in a blend of VR and reality where the line between the two is blurred and it’s exactly that blurring of lines that Kendra scripted into the shadows. When does the shadow stop being you and when does the dance stop being virtual? What is real and what is NOX! This is a long way from when her BirdGang Dance Company started in 2005. Kendra received a grant from Arts Council England to allow the project to get off the ground with an initial private showing at the Young Vic. The feedback was so unanimously positive that they’re now raising the funding for a full-scale version. Kendra is hell-bent on bringing dance theatre performances to the people using Virtual Reality. The plan is to be able to deliver dance to schools, care homes and prisons for people who don’t have easy access to the arts. 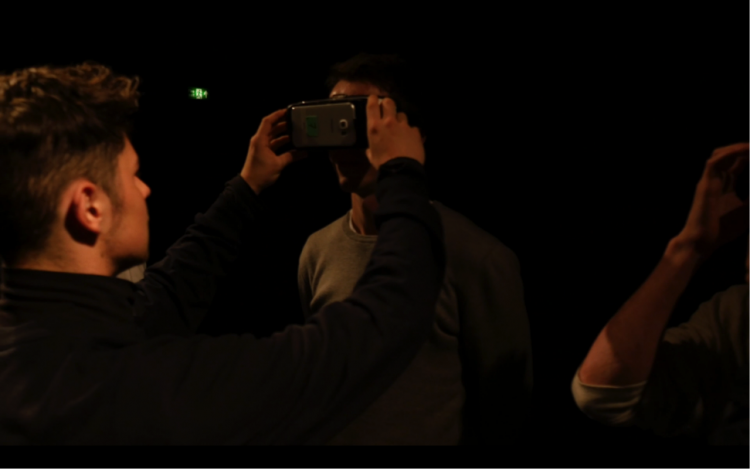 Even if you’re not one of the VR headset-wearing participants, NOX was created so that an unlimited number of spectators could watch the show and those wearing the headsets and participate live at the same time. Have tech companies have been answering a question that no one asked? Has Kendra just asked the question VR companies should be trying to answer? Contact: info@birdgangdance.com for more information and to get involved.